How Can I Implement <em>Choosing Wisely</em> In My Practice or Health System? Whether looking to implement Choosing Wisely on a large or small scale, the following resources can help guide physicians looking to align their practice with the campaign. Email Washington State Health Alliance to request technical specifications that include 11 claims-based measures of Choosing Wisely recommendations and three clinical-based measures. All are updated to ICD-10. If you are interested in implementation, these measures are all Choosing Wisely-specific. A summary of the 2017 Connecticut Choosing Wisely Collaborative‘s “Call To Action” Summit details insights and recommendations around implementing Choosing Wisely to empower and engage underserved populations. Topics include ways to engage the care team, empower consumers and target campaign marketing. The American Society for Clinical Pathology created this online toolkit to promote the campaign in the community. Included are links to articles and blog posts, implementation guides, handouts and posters available for download, among other resources. For physicians or other health care leaders struggling with how to integrate Choosing Wisely‘s evidence-based best practices into their practices or organizations, this guide from the Washington State Choosing Wisely Task Force provides a step-by-step approach to making system-level changes. The Task Force has also created a toolkit that provides primary care, specialty care and school-based clinics guidelines for prepping the care team from appointment-making to checking patients out. This report details alignment to Choosing Wisely recommendations in Washington state county-by-county. The goal of the report is to inform local discussions about appropriate health care. These guides and scripts for both faculty and students aid in discussions with medical students about treating lower back pain, sinus infections, testing for headaches, pap tests and cardiac testing. This toolkit includes practice and workflow scripting, and easy ways for a practice to start empowering patients through Choosing Wisely. Our neighbors to the North, Choosing Wisely Canada, have created a series of toolkits to provide a starting place for implementation by clinicians who have achieved significant impact in implementing a Choosing Wisely recommendation in their setting. 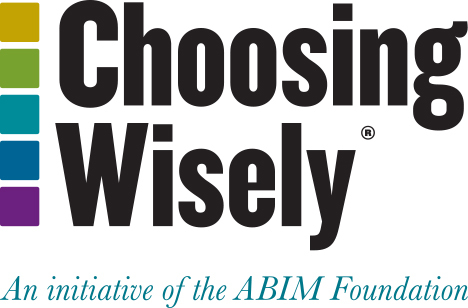 “Advancing the Choosing Wisely campaign in Clinical Practices and Communities” details the stories of success and lessons learned from the first round of Choosing Wisely grantees, 21 projects that sought to educate physicians about the campaign. Stories of Choosing Wisely implementation across the country, from small individual practices to large health systems, can help those looking to implement campaigns of their own. The Choosing Wisely Champions program recognizes clinicians or teams of clinicians for their significant contributions to advancing the goals of the campaign. Email us to join our network of health system leaders to learn more about implementing Choosing Wisely. The network offers a monthly resource email and quarterly webinars. Email us to join our Choosing Wisely Learning Network, which includes a bi-monthly webinar series highlighting the work of past and current grantees who are implementing the campaign in their community or system, and expert guests sharing best practices for reducing overuse. Learning network members also have access to a shared virtual space and receive a monthly resource email and the Choosing Wisely Connect email. The Centers for Disease Control and Prevention’s “Get Smart About Antibiotics” campaign addresses the dangers of unnecessary antibiotics. This information can be used in conjunction with the Choosing Wisely materials to help inform providers about the push to reduce antibiotics prescriptions. Modules created by Kognito walk users through simulated encounters from either the patient or provider point of view to aid conversations about avoiding unnecessary antibiotics. Part of its Steps Forward set of practice improvement strategies, the American Medical Association created a module to help physicians advance Choosing Wisely in their practice. These interactive instructional modules were intended to enhance physician and patient communication around the specialty society recommendations from the Choosing Wisely campaign.